FREE ON-SITE DEMO OF OTC-3824 FROM BOSCH TRAINED EXPERTS-CLICK HERE! All major HD OEM's covered, all Medium Duty OEM's Covered. Bosch provides 3 updates per year and the software is substantially improved on each update. You need to download the RP1210 software drivers from www.boschdiagnostics.com website. These drivers allow additional OEM factory software you may have to be loaded on the tablet. The drivers supply the vehicle communication interface (VCI) software for communication through the adapter cables supplied with this scan tool. Light Duty Trucks - Basic code reader capability OBD-II (1996 and newer) Cars & Light Trucks. Scan Tool Subscription: Purchase includes 1 year of scan tool updates with with all functionality turned on. Bosh schedules 3 scan tool updates per year. At the end of the first year, the annual subscription cost is $1500. If the subscription is not renewed, all of the bi-directional control features and repair information will be turned off. Only the code reader functions will be enabled. Troubleshooting/Repair Database Subscription: Purchase of this tool does NOT include the Troubleshooting/Repair Information Database functionality. The troubleshooting/repair database subscription is a separate product (part # OTC-3824-08R) and costs approx. $1150 per year. 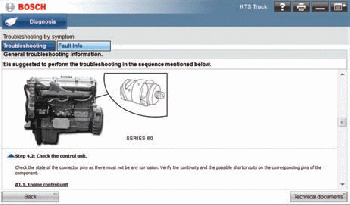 This annual subscription provides access to the troubleshooting and repair information database only. Purchase of this tool requires the end user to sign contract with OTC for use of repair information contained with the tool. Tool registration with OTC is also required. Increase Shop Efficiency- One Tool Does it ALL!